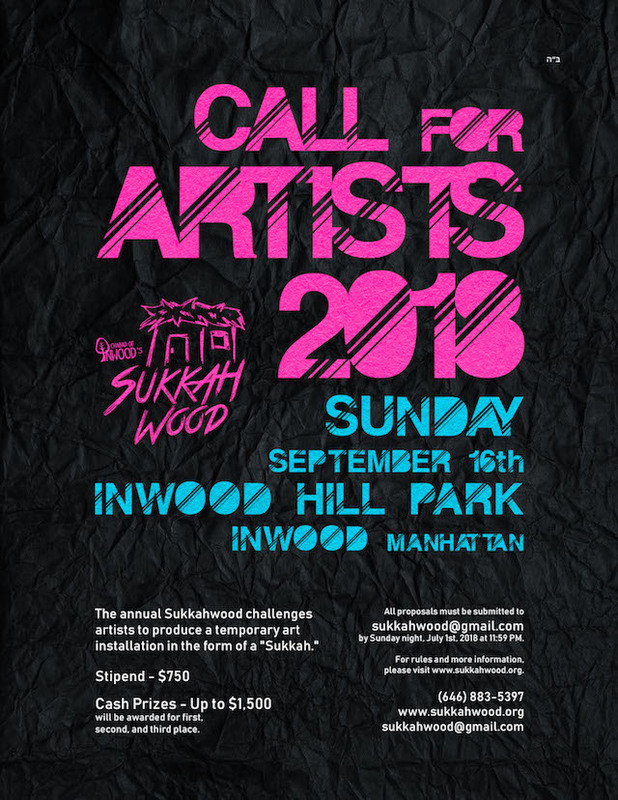 After a smashing first year, Sukkahwood is pleased to once again invite artists and designers to re-imagine a “Sukkah” and be part of the “Sukkahwood” outdoor exhibition of temporary dwelling installations. The Jewish Art Salon is a co-sponsor of the event. Sukkahwood‘s values of inclusion are universal and seek to bring together people from all walks of life. Sukkahwood is about re-thinking an essential Jewish tradition through unique and out-of-the-box thinking, using materials with a focus on sustainability and affordability, and connecting to our beautiful New York City parks. Each artist may submit one design for their sukkah- a temporary shelter or hut that is the central element of the Jewish holiday of Sukkot. 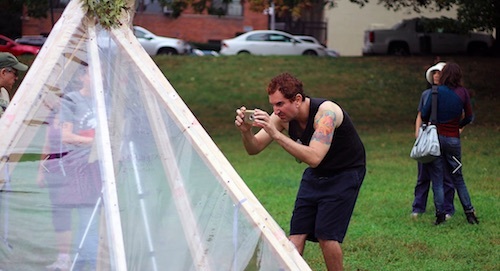 The structures will be on display for one day in Northern Manhattan’s Inwood Hill Park. Each sukkah must be designed to be built and taken down on the same day of the event. Each artist or group of artists selected will work together with consultants to ensure that the structures retain the nature of a Sukkah. The artist is asked to be as creative as possible while working within the guidelines. We ask each entrant to consider questions such as “What is a home?” and “How can a home be temporal, ephemeral and connected to nature?” This project is designed to push the boundaries of an age-old tradition and implant it in a contemporary setting. The challenge of this competition is to explore what a contemporary Sukkah could be – focusing on modularity, sustainability and affordability, while maintaining a diverse and rooted meaning of time and space. Please join us in our mission to connect the arts with tradition and foster community across all lines. Curator: Goldie Gross is a Brooklyn-based artist and curator from Crown Heights. She has curated Natural Instincts for the Jewish Art Salon, and is currently curating The Invisible Jew and co-curating POW!!! Jewish Comic Art and Influence. She co-produced the Jewish Art Salon’s exhibition Jerusalem Between Heaven And Earth at the Jerusalem Biennale 2017, curated by Ori Z. Soltes. Awards: Cash prizes up to $1500 will be awarded at the event for first, second and third place. Stipend: Each participant will receive a $750 stipend, to be paid out in three increments at the time of acceptance, completion of structurally sound pre-model, and at the event itself.